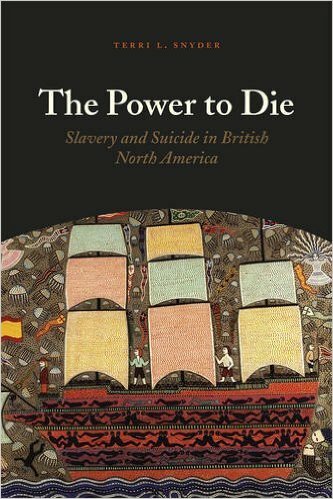 Don’t miss John Fea’s interview of Terri L. Snyder about her brand-new book, The Power to Die: Slavery and Suicide in British North America (University of Chicago Press, 2015)., which I learned of via the ubiquitous and always-in-the-know Liz Covart on Twitter. During my research for my first book, I was reading county court records from seventeenth- and eighteenth-century Virginia and noticed reports of suicide. Most of these accounts described self-destruction by young, indentured servants who died under bleak circumstances; their stories both absorbed and troubled me. I started collecting any references to suicide that I came across — from courts and legislatures, newspapers and periodicals, slave narratives and plantations records, for instance – and amassed a surprising amount of material. I ultimately focused on the suicides of enslaved men and women, however, because my research revealed that their deaths were understood, reacted to, and remembered distinctly, in ways that differed from those of free European Americans. Wow! Extremely cool stuff. I remember seeing advance notice of the book somewhere else,and thinking I should chase it down, but it’s very handy to be reminded. Thank you! And yes, I will put in a purchase request to my library, since the price is a bit steep (normal enough for an academic book). Some years back I was trying to frame a possible essay on an important Englishman who died in late-colonial New York under curious circumstances that were officially classified as suicide, a conclusion that I strongly doubted on circumstantial grounds. In looking at the literature on the phenomenon itself, I found that… there wasn’t any, save for a short-lived irruption of interest in Europe a generation ago. I mean, in an otherwise seemingly definitive multi-volume _Encyclopedia of American Social History_, there were more entries in a chapter on “Death” about “Pet Cemeteries” than there were about suicide. The essay got shelved, pro temp, but my specific qualms about the interpretation of the episode in question–that it was a homicide, an assassination, really, not a suicide–and my more general wonderment at the historiographical invisibility of the practice, remain in place. Maybe this book will open the subject up.